Description: Heading out of Utica and onto Tamora next. Finally I get to see a BNSF ACe in person., luckily the westbound before this one had an ACe leading. Description: Note the dead aposim on the road, no I didnt run over it. Description: Waiting to get through BN Jct. is BNSF Train C NAMPAE0 13 bound for Palos, AL. 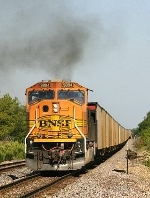 Description: BNSF Palos Coal train. Description: BNSF 9894 leads E-RRSNAM0-20A east through the Ashland Wye on the Creston Sub. Description: M T coalie with a MAC leading. First H2 mac id shot since August. Hopefully it wont be the last.